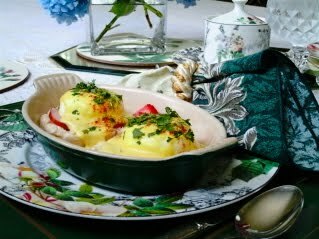 Abbington Green Bed & Breakfast Inn, Asheville NC: Serving You Breakfast, Says Asheville Bed and Breakfast, Is Both Elegant and Organic! Serving You Breakfast, Says Asheville Bed and Breakfast, Is Both Elegant and Organic! Here in Asheville we are fortunate to be surrounded by many local farms. They provide organic and sustainably produced eggs, milk products, poultry and meats as well as fruits and vegetables. So you can just imagine the bounty at all the many tail-gate farmers markets in the Asheville area are a popular spot for locals as well as visitors. 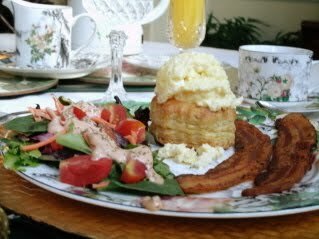 At our Asheville bed and breakfast, I believe that you deserve an outstanding breakfast each morning. And it will not only be elegant, served on crystal and china that reflect the "bit of Britain close to home" that is our theme, but also it will be made from substantially organic ingredients. Why organic? Why does it matter enough to justify spending so much more to get all those organic products? Are not the "conventional" products just as good? Well, I have to say that I would have asked the same questions a couple of years ago. The answers now are that, no, many conventional products may incorporate unnecessary or harmful chemicals including antibiotics and growth hormones and pesticides... so generally, we'd be better off avoiding them when we can. And yes, the organic products are more nutritious...so our Asheville bed and breakfast is happy to emphasize serving you the best of the best! And my breakfast philosophy, if you call it that, is that we provide something more akin to a lovely brunch each morning. It consists of several courses, chef's choice each day. It might also include something unexpected like a salad with an organic dressing along side the main course. It often includes a lovely piece of cake along side the fruit course. And on a busy day, in a setting very much like Thanksgiving Day dinner, you'll find people talking, relaxing, eating well at the start of a lovely day in Asheville! (Of course, we are also happy to do our best to accommodate any dietary restrictions our guests may have...so we always ask about that in advance of our guests' arrival). So we hope you'll visit our Asheville bed and breakfast soon. And when you do, your breakfast will be both elegant and organic!